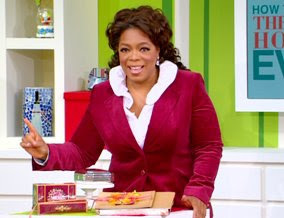 First retailers promise to slash prices, then Oprah decides not to unveil her "Favorite Things " due to the looming economy and instead shared her all-time favorite gifts she's ever received. Even fashion/lifestyle publications are listing popular gift items for the budget savvy shoppers. A decorative pill case/eyelash holder, this is a funny one! My aunt Betty always complained to me that I was so difficult to shop for. She said I had everything ! She was well aware of my affection for fabulous gadgets and luxury items so she gave me the one thing in 2006 that I didn't have. We would always joke about my false eyelashes and how I would misplace them from time to time. (yes ladies you can re-apply them, the better quality ones at least...) The pill box was a snazzy pink adorned with an image of a black stiletto. That gift was soooo me. I knew she put some thought into it and it makes it rounds with me in my make-up bag daily.